The stamp, entitled ‘Theotokos, Mother of God’ depicts the Virgin Saint Mary embracing the Infant Christ. It is an example of the beauty and deeply rooted Faith and culture of the Coptic Orthodox Church, the largest Christian denomination in the Middle East which traces its roots back to the Apostle Mark in the first Century. Since its establishment in the United Kingdom in the 1960s the Coptic Orthodox community has been increasing in size, and more recently in activity. The Coptic faithful in the United Kingdom are active members of society who contribute to their wider community through a variety of spiritual and social networks and programmes. Along with this historic stamp, an icon from the Coptic Orthodox Cathedral of St George depicting St Mary and the Child Jesus, also written by Fadi Mikhail, has been chosen by Christians Aware as part of their Christmas card collection for 2013. 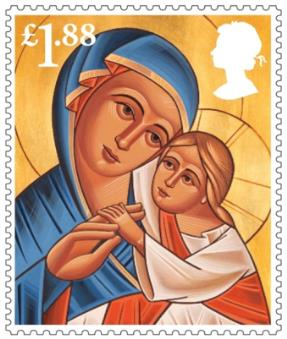 0 Comment(s) to the "Royal Mail unveils their 2013 Christmas stamp collection featuring a Coptic Nativity icon by Hertfordshire-based iconographer Fadi Mikhail"